Have a small multifunctional tool: our super compact and portable multi-purpose tool can be easily put into your backpack, key chain or pocket, so that you can carry it with you. It is designed especially to use as little space as possible, and as your ultimate outdoor partner. A MUST FOR YOUR EVERYDAY LIFE: You never know when this multipurpose tool will come in handy. Great for normal people living their everyday lives and an ESSENTIAL for travellers, backpackers, hikers, runners, bicyclists and adventurers! 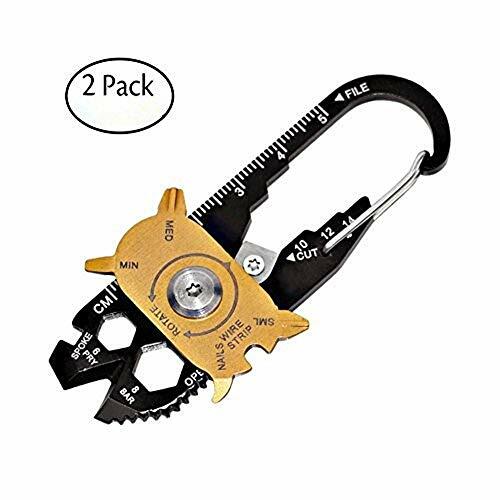 there are 20 solutions in your pocket: this gadget can be used as a mountain-clasp opener, a screwdriver, an outdoor pocket knife, a ruler, and a lot! Material, 3 cr 3CR steel.Even if you use it every day, even if it gets wet, even if you've been there for years, it's always as good as new! You'll never feel helpless again!With a multi-purpose gadget, you feel like a hero.The perfect gift for a man! If you have any questions about this product by sincepeneer, contact us by completing and submitting the form below. If you are looking for a specif part number, please include it with your message.